Directions: From I-25 take 34 (Einsenhower Blvd) west through Loveland towards the foothills. Turn right on Hidden Valley Drive and a left on Plaster Mill Rd. The parking area and trailhead will be on your right. Devil's Backbone Open Space is a large, and long, open space area just west of Loveland. The park connects on the north to Rim Rock Open Space which in turn connects to Horseshoe Reservoir in Ft. Collins. 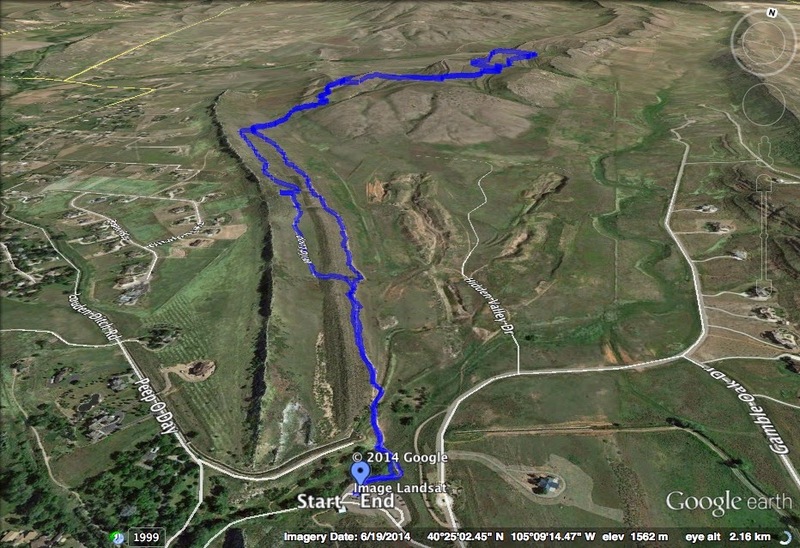 Theses parks make for a long greenway of hiking in northern Colorado. On this hike you explore the southern portion of this area via three small loops connected by the Blue Sky Trail. The trail starts off heading north along the valley next to the "Devil's Backbone" a hogback that has eroded away to a towering rocky spine. There are various trails that go closer to the spine and explore its interesting nooks and crannies. There is a trail connecting to the other side of the hogback but for now stay to the east, you'll explore the west on the way back. After about a mile, you'll leave the backbone and start climbing up the ridge to the east. From here you get great views of the backbone with Longs Peak rising in the background. After 1.7 miles you'll reach the Hunter Loop, go left or right it doesn't really matter, both are great short trails. After the Hunter Loop you'll reach a a saddle. Continue on and descend down to the Laughing Horse Loop. I suggest staying right at the fork in the trail. The Laughing Horse Loop is a terrific trail through a very varied terrain. You roll over scrubby hills and scramble across red rock boulders and slickrock. The return portion of the loop follows the top of a red rock ridge as provides really fun hiking and wonderful views. On the return trip take the other sides of the loops, working your way back to the trailhead. Be sure to take the western portion of the Wild Loop to see a different side of the Backbone. This is a great trail and you can make it as long or as short as you like. The terrain is wonderful, the views are great, and you'll want to come back time after time to explore more and more.